Nasser Al-Attiyah has reduced Carlos Sainz's lead to under nine minutes after his stage nine victory. (CNN) -- Nasser Al-Attiyah dominated the ninth stage of the Dakar Rally to take a big chunk out of Carlos Sainz's overall lead. 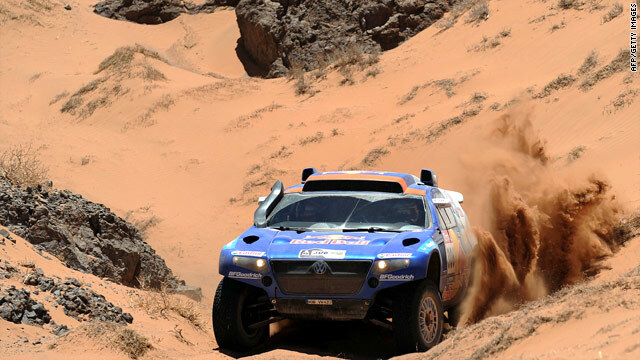 The Qatari driver set the fastest time at all checkpoints along the 338km stage between Copiapo and La Serena to beat the rest of the field by over six minutes and claim the sixth Dakar stage win of his career. The 39-year-old led home a Volkswagen 1-2-3, with team-mate Sainz the next man home. The Spaniard's overall lead is now down to eight minutes and 36 seconds. South Africa's Giniel de Villiers was third with Guerlain Chicherit the first BMW home in fourth. America's Mark Miller is third overall in another Volkswagen with Stephane Peterhansel fourth. France's Cyril Despres continues to march towards success in the bike class, despite being beaten by four seconds by Marc Coma on Monday. The KTM rider holds a huge lead of 1:21.50. Vladimir Chagin secured yet another stage win in the truck category as he further extended his advantage in the standings.